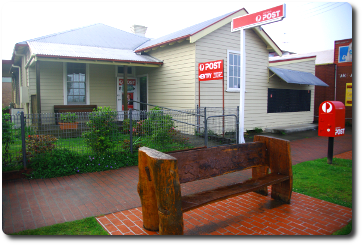 Welcome to Bulahdelah Post Office. At Bulahdelah Post Office we have a vast range of products and services and always give our customers that extra special care. Drop in and experience country service at its best. Here you will find lots of information about the products and services available to you at Bulahdelah Post Office including: Bendigo Bank Agency; Stationery and Office Supplies; Greeting Cards; Giftware; Pre-Paid Mobile Phones, Phone Cards & Recharge; Inkjet and Toner Cartridges; Fax, Photocopying and Laminating Services; Postage & Packaging Products; Post Billpay; Business Banking; Bank@Post; Express Post; Gift Cards; Post Office Boxes; Western Union; and Passport Applications and Passport Photos.